Design software for material layout to reduce waste. Avoiding three problems running the optimizer. 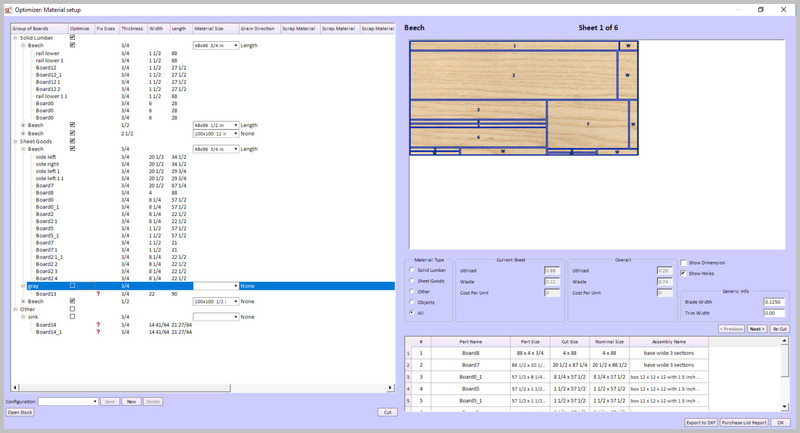 Design software for material layout allows you to save time actually planning for all of your cuts. In addition it minimizes the scrap or cut offs by calculating the best layouts. One major feature in our Professional version is the design software for material layout. A user wrote in with a question about a problem he was having trying to optimize his project. I put together this short video of me analyzing what might have gone wrong. The source of problems with the optimizer – evidenced by red highlight boxes around part names — is almost always one [or more] of three things. The material exists but is not sized with the stocking function. Wrong orientation for a board. Wrong direction for the grain. So if you have questions or problems send me an email.